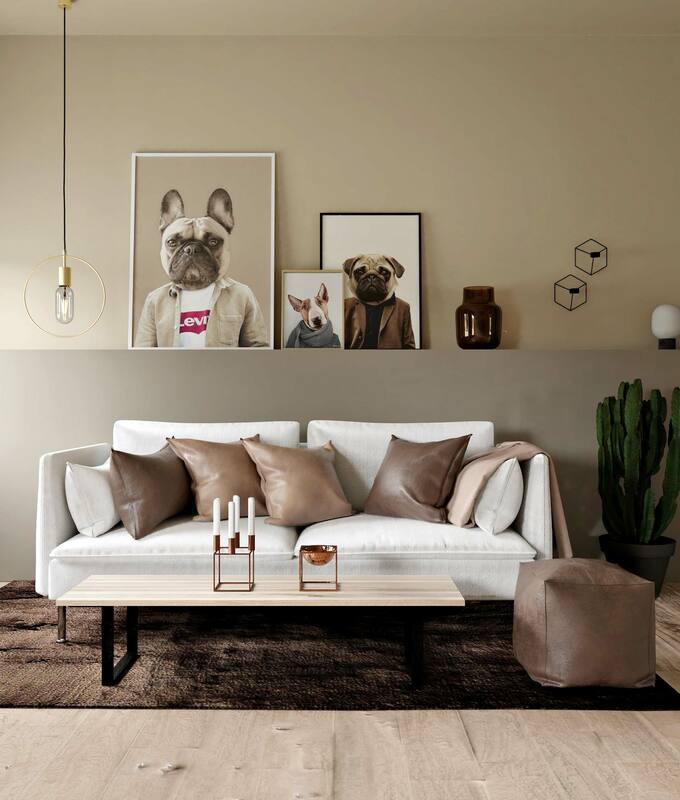 Creating the perfect gallery wall can sometimes be a difficult task. 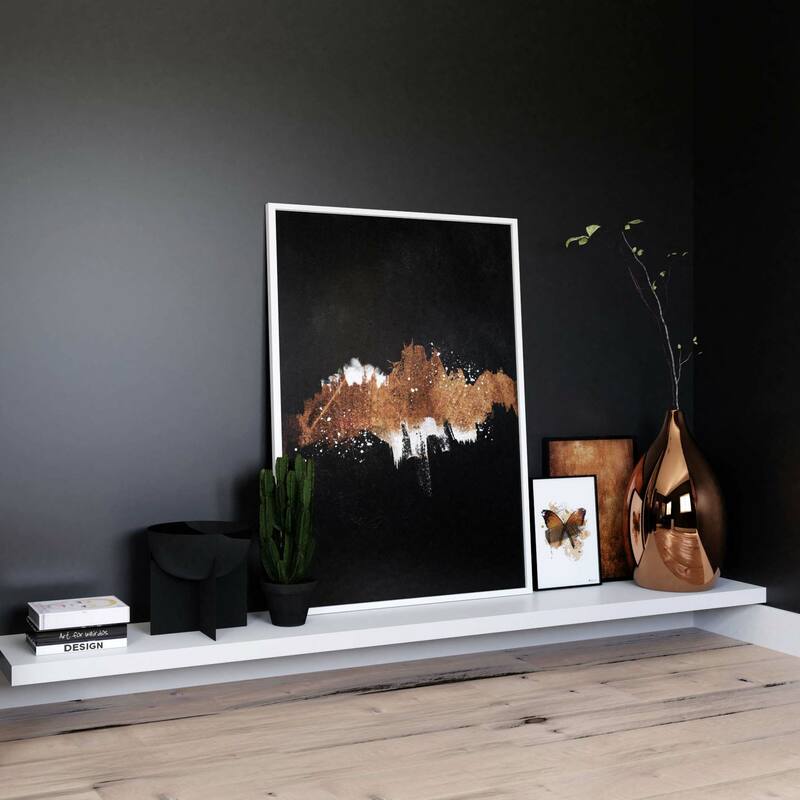 There are many things to consider: choosing the perfect layout, what kind of frames you should use, the theme and colors of the art, and finally putting this all together to create the perfect picture wall in your home. There are so many ways to create the perfect art wall, and that doesn’t make the task any easier. What is the best solution in your home, and what suits your style? Well, we share daily inspiration on social media (Instagram and Facebook), so that’ll be a great way to start your search for your next poster wall. 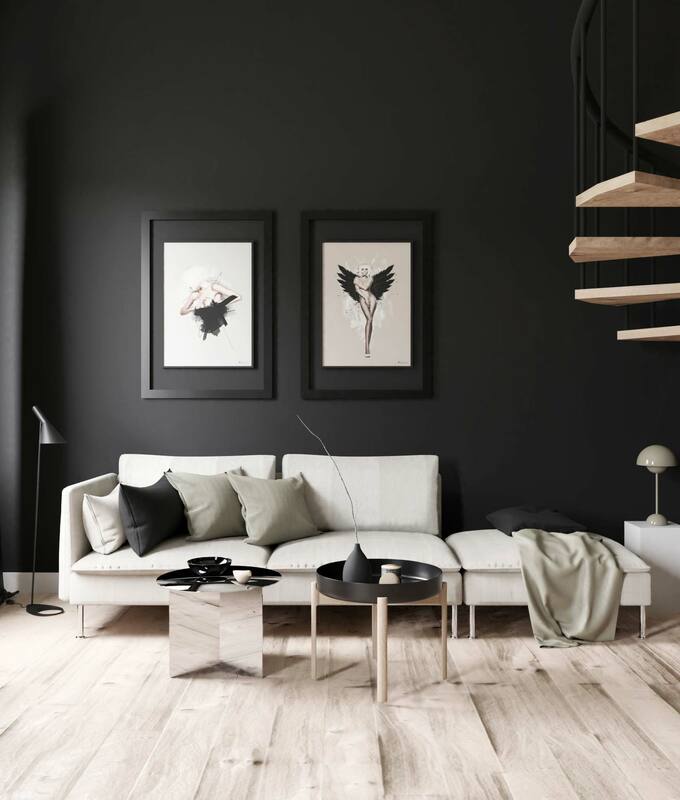 But in this post we have picked out 10 unique gallery walls, that you haven’t seen before! We have put together the best of our eye-catching layouts, that require a little more than just a couple of frames, but they’re DIY projects that you can manage at home! So, let’s dive into it! More and more, people are using narrow ledges designed for photo frame display, as a pretty way to show off their art and photos. There are different ways to do this of course, and we’ll show you some examples! This is a pretty and neat way to use picture ledges. 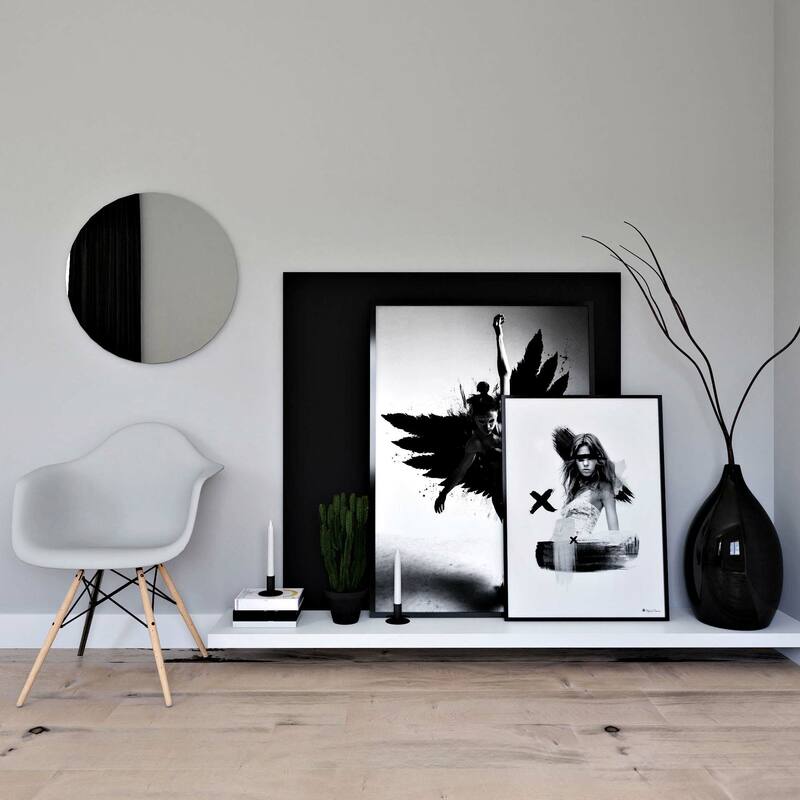 Mixing the frames with books and decorative objects creates a personal look, and you can easily change the position of the art without having to worry about holes in the wall. 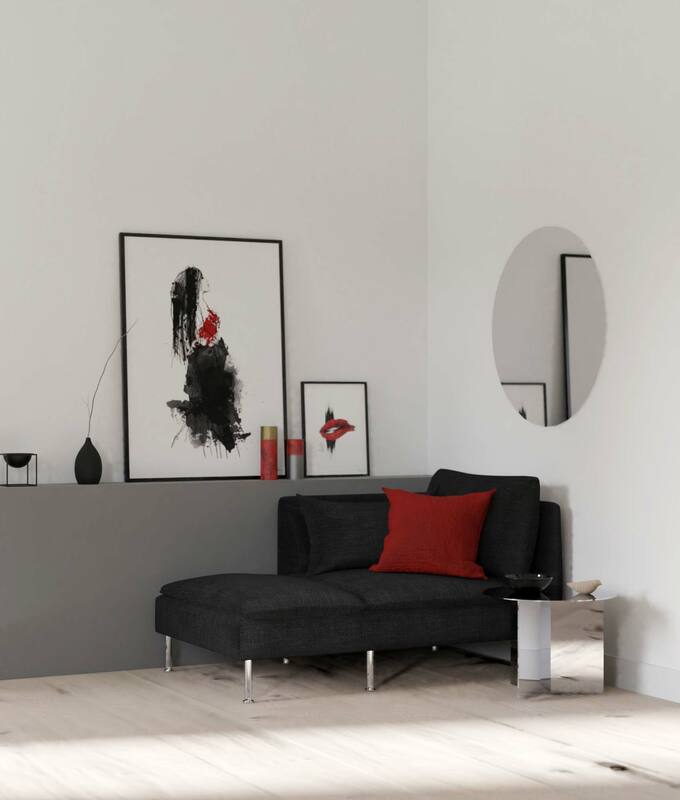 Picture ledges let’s you change things according to mood and style, which gives you a lot of creative freedom. A good advice, though: Don’t use frames bigger than 30×40 cm, as they can tip over and end up broken on the floor. Been there, done that! This display is therefore mostly for smaller artworks and photos, like 21×30 cm, 30×40 cm and of course Art Cards! If you’re looking for a more clean look, you could always paint the ledges in the same color as the wall. This will make them blend more with the wall, and create a subtle look. Another way to use picture ledges to display your posters, is to only use the posters! 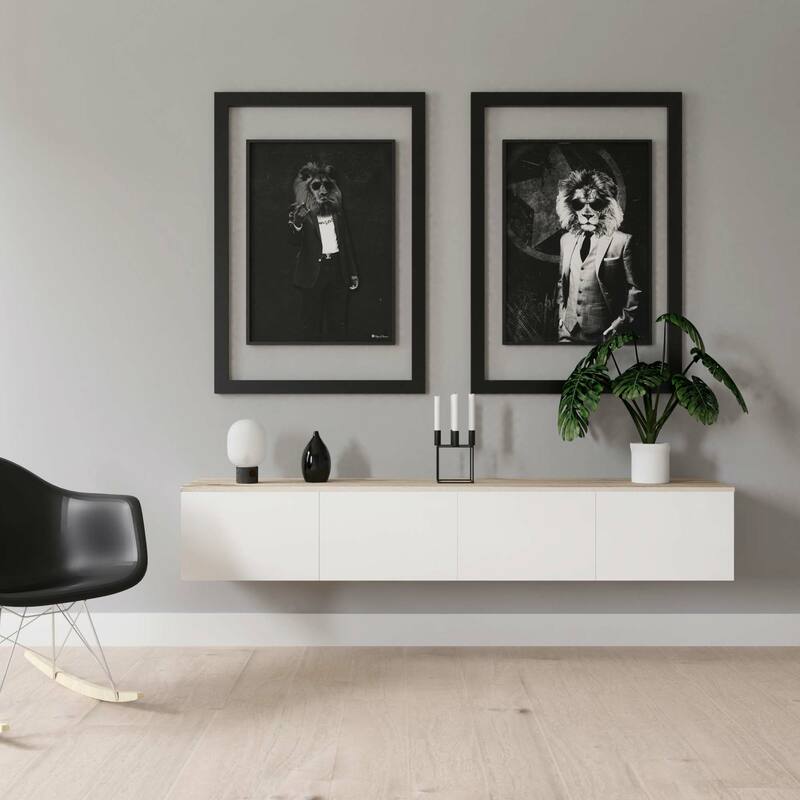 Give your walls a modern, “kiosk“ expression by placing frames side by side. Use at least two rows to complete this look. Go low! We’re so used to seeing shelves hanging at eye-sight, but we love to break the norm, so we choose to go low! Place a wall shelf right above your baseboard, (or at a height where the vacuum cleaner can easily access). This will give the wall a cool look, really just because it’s not something we see that often. Decorate the shelf as you normally would, but now you have the opportunity to also go big! Depending on where you place the shelf (on a clean wall, under windows etc), now you can use have big posters and art prints! Probably much bigger than if the shelf was placed higher up. Wall art is not just for hanging on the walls, peeps! Or, of course, you can drop the shelf and place the poster on the floor. I would recommend using larger art prints for this, at least 50×70 cm. 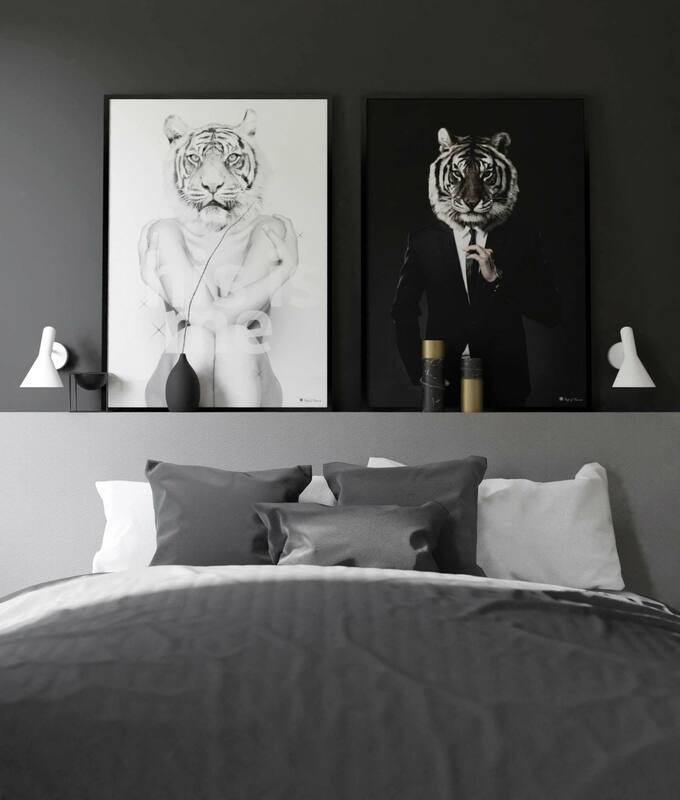 Have an entire wall filled with your favourite posters and prints! If you have a free wall and you don’t really know what do with it, fill it top to toe with framed art! 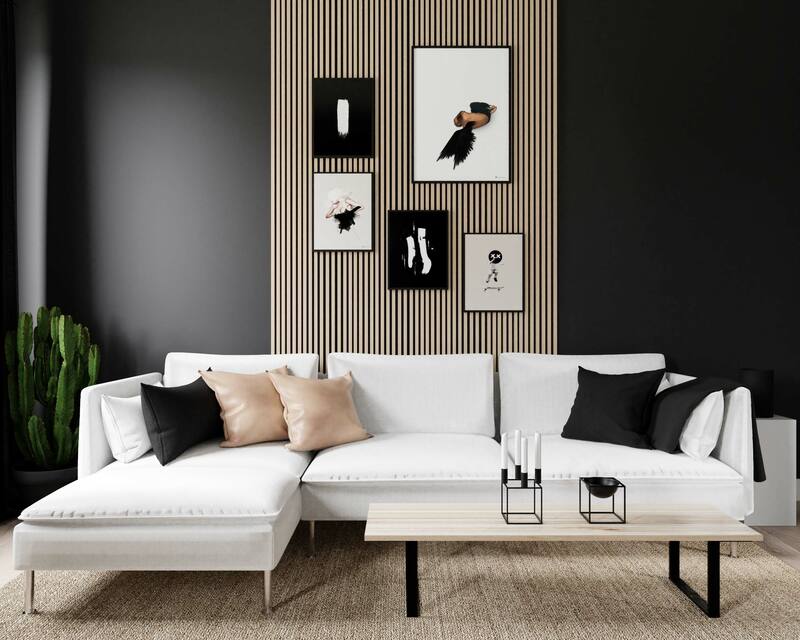 This kind of gallery wall is trending more and more, and we’re so delighted to see that wall art are getting more focus in people’s homes! A metal wall grid is perfect for displaying our art cards! Use different clips to hang the cards to the grid, and combine it with, for example, personal notes, paint samples, jewelry and accessories or whatever you feel fits! 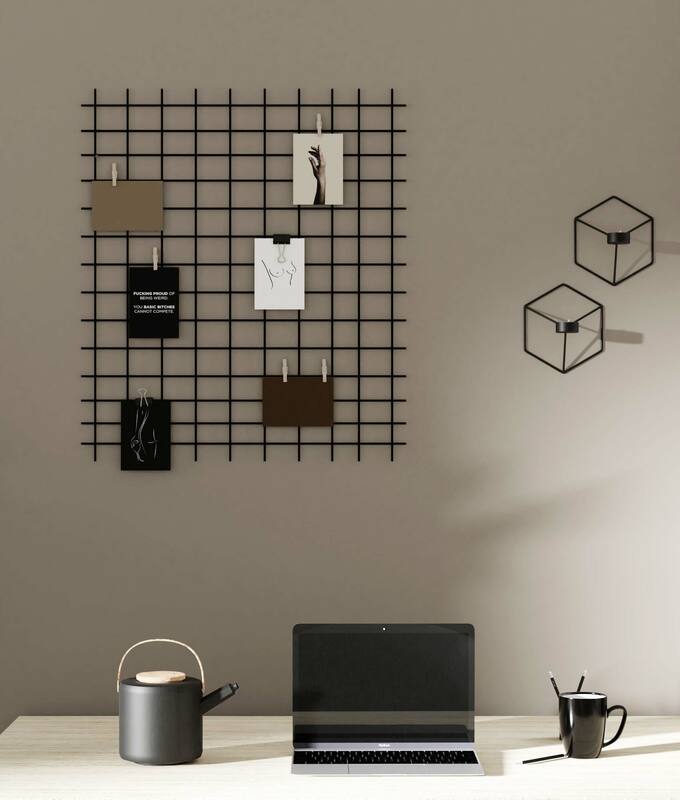 A metal wall grid are perfect for these little art works! A shelf box can be really easy to make. All you need is some tools and some wood. 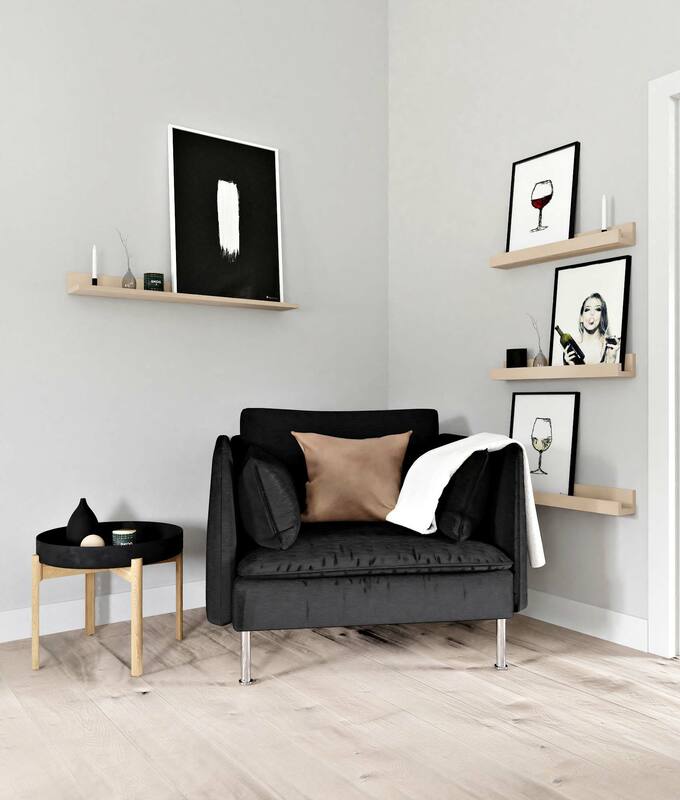 However you choose to make it, the idea is to create a shelf behind your bed or sofa where you can place your art and decor. Personally I love to paint the box in a contrast color, or in a color variation of the wall, but of course the options are limitless! 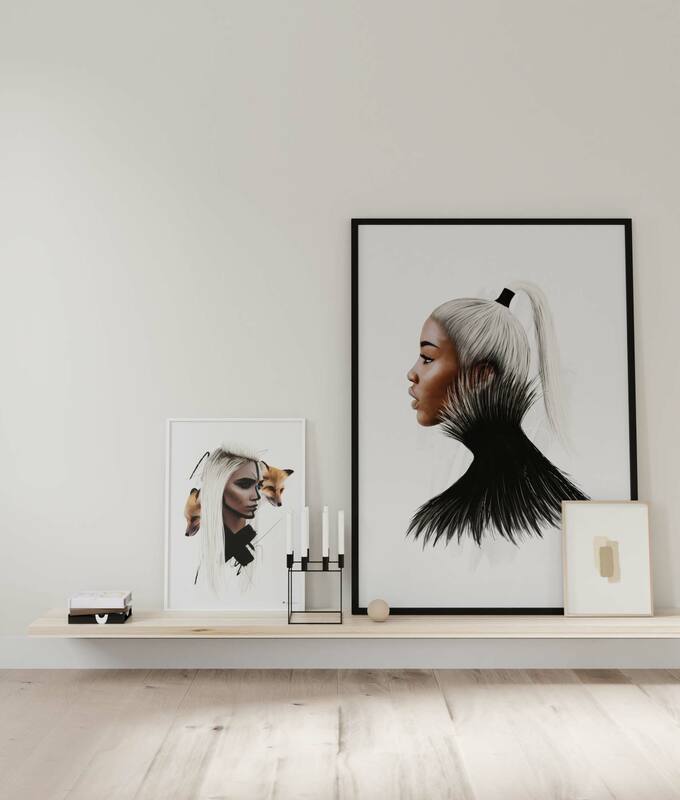 If you’re feeling creative, and want a unique gallery wall, try this! 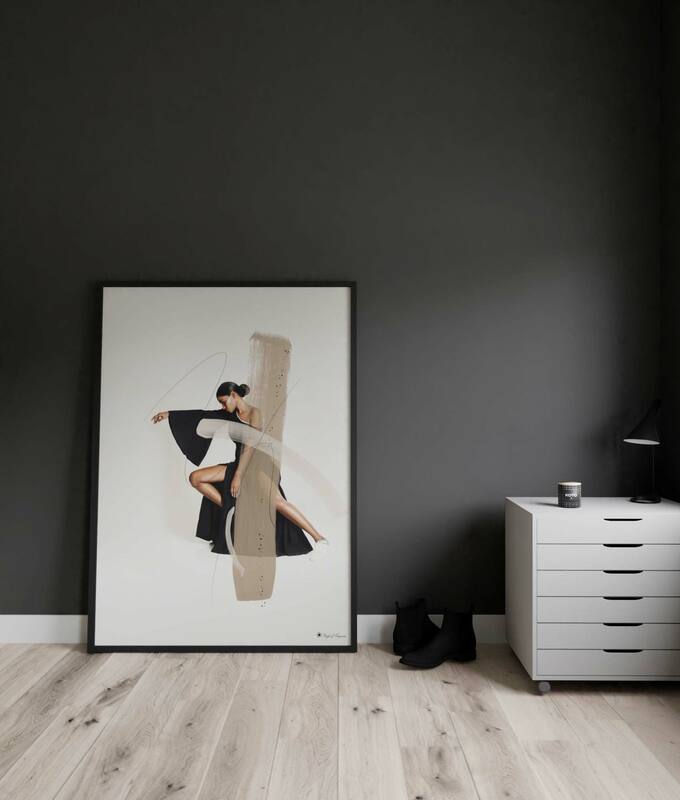 Having a frame outside the picture frame gives a lot of focus to the poster, and it also decorates your wall in a very eye-catching way. For this example we have used baseboard wood, painted them and placed them around the print. However, you can also use a canvas frame kit or other types of moulding frames to create the frame-in-frame look. Choose the look of you outer frames by painting them in different colors, or do as we have: Paint them in the same color as the wall, but with more shine to give it some contrast. 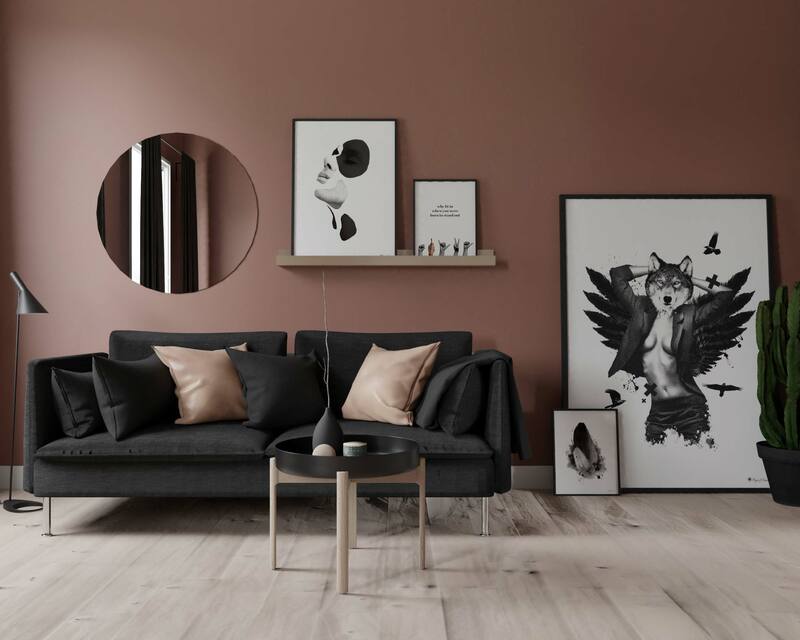 Wall is painted in Jotun Lady Pure Color Supermatt, “Dempet Sort”, and the frame is painted in Lady Supreme Finish Halvblank, “Dempet Sort”. How about giving your picture wall a playful look with boxes? 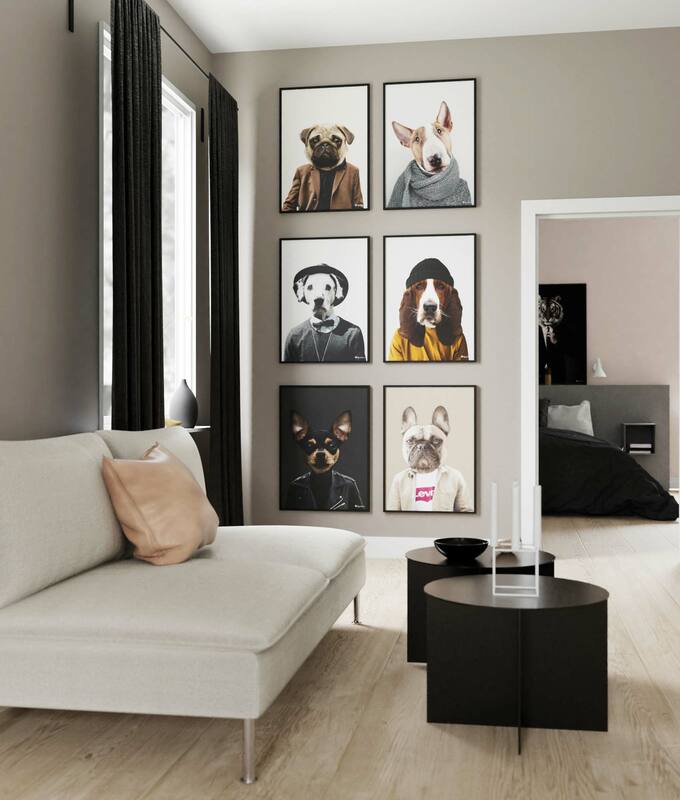 Place the frames on boxes and give your walls some 3D effect! Play around with different sizes and depths! These boxes are easy to make and you’ll get a gallery wall that not many have in their homes! 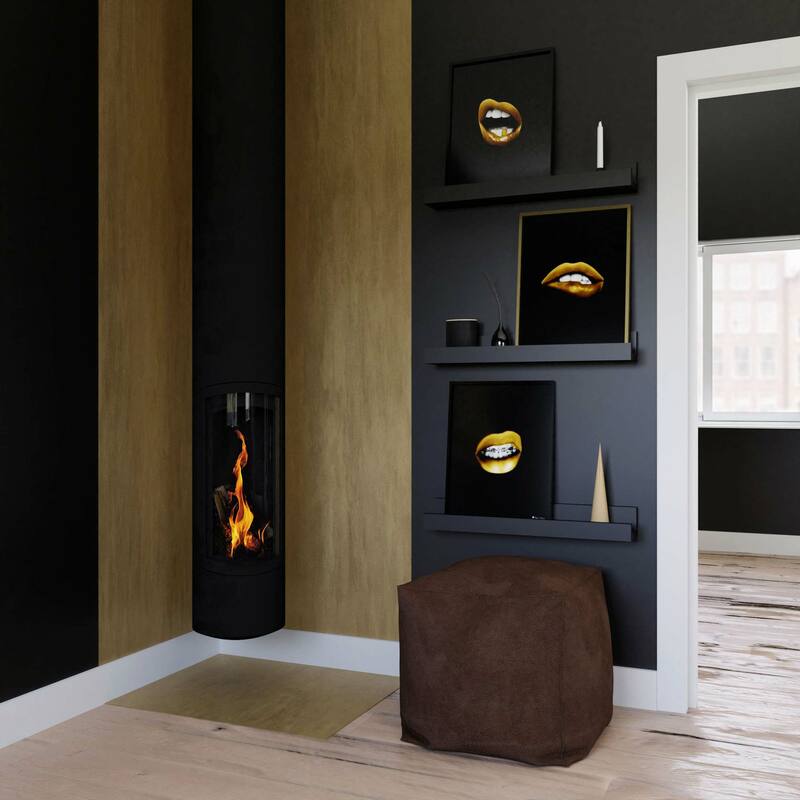 Wall is painted in Jotun Lady Pure Color Supermatt, “Dempet Sort”, and the boxes are painted in Lady Supreme Finish Halvblank, “Dempet Sort”. 8. Hang it on wood slats! This is a personal favourite for sure! Using wood slats has become more and more popular in Nordic homes, and we’re loving how many creative uses it has! 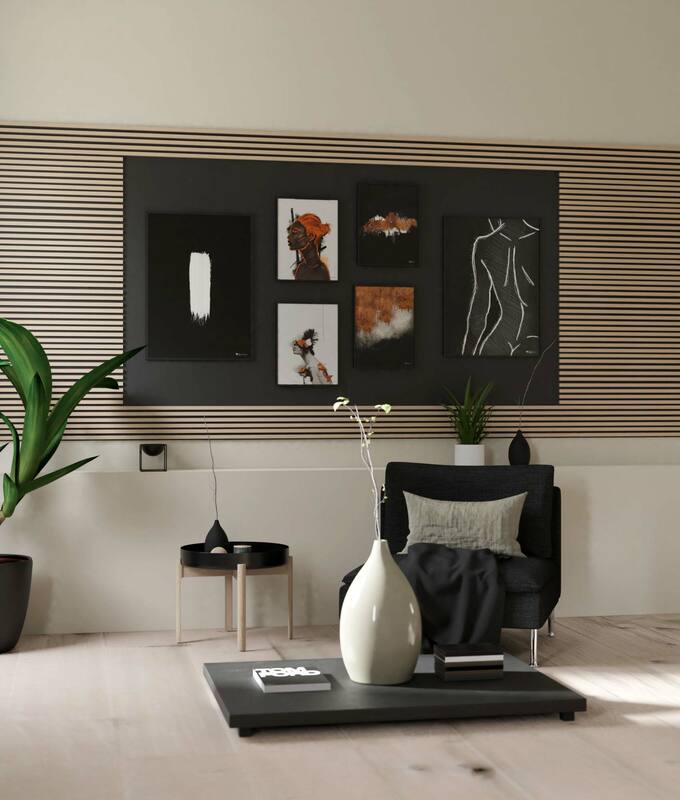 For this gallery wall you can place your prints on wood slats and let your entire wall be a piece of art! 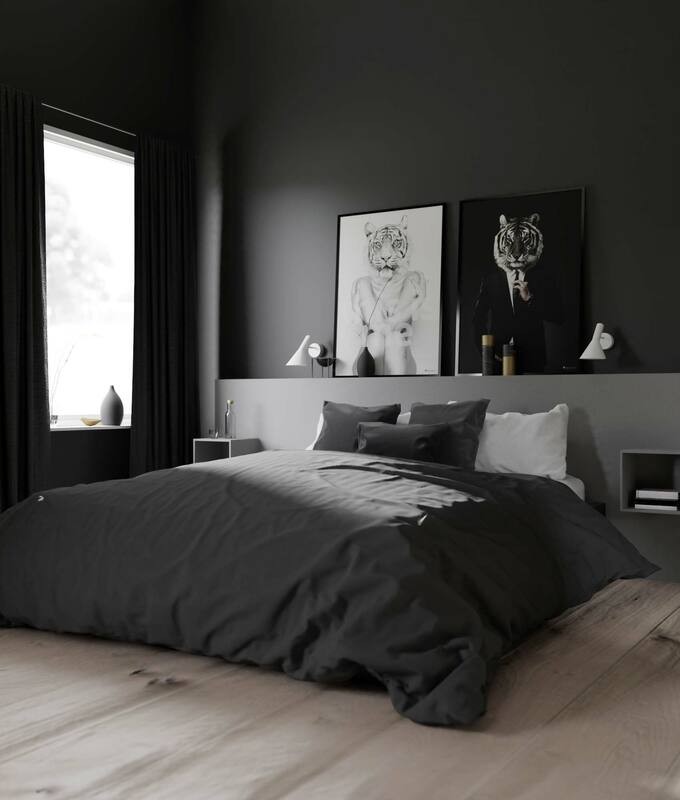 The natural wood gives the room a warm and inviting vibe, but painting them is absolutely also an option! Give them a contrast color or, do as we mentioned earlier, paint them in the same color as the wall, but with a little more shine for a subtle contrast. 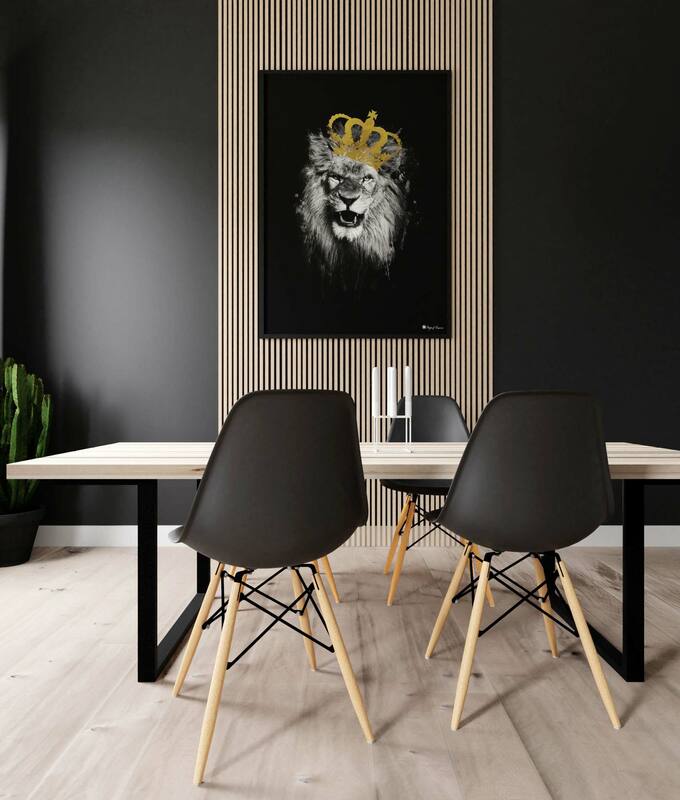 Wall is painted in Jotun Lady Pure Color Supermatt, “Dempet Sort”, and the wood slats are painted in Lady Supreme Finish Halvblank, “Dempet Sort”. 9. Hang it INSIDE the wood slats! Yes, that’s right! There’s more ways to use the wood slats to create an awesome gallery wall! Same thing as the above, only here we have made space in the middle for the frames to hang directly on the wall. For this example we also painted the open area in the middle in another color, to give the poster even more focus. 10. Wired Picture Wall as a Room Divider! OMG, this gallery wall might be one of the coolest we’ve ever created! Back to back frames, wires and wood to hold everything in place. That’s it! This layout demands a little bit of work, but with some planning you can make this yourself at home! Connect the wires to the wood slats, put some screws in the wood and hang your frames! 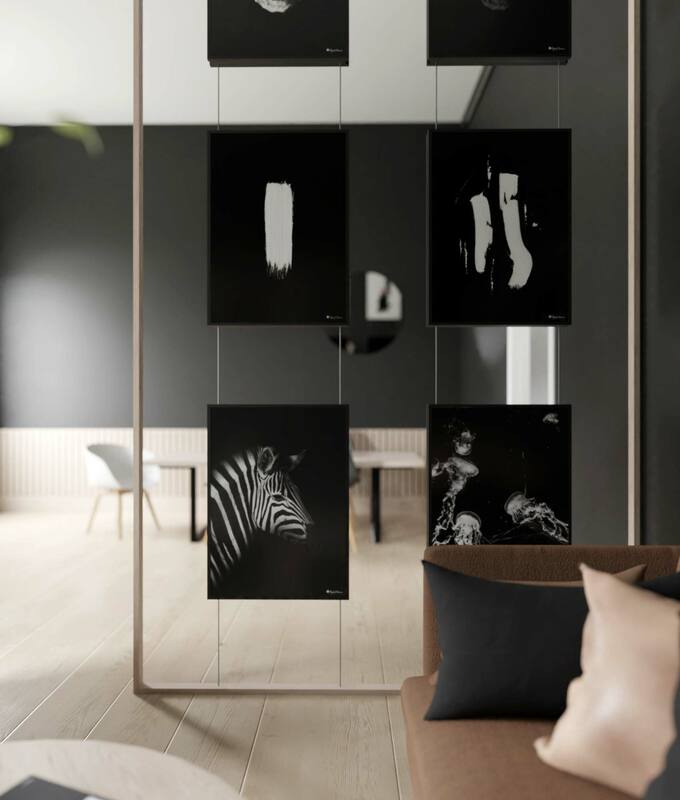 Such an amazing picture wall that also works as a room divider, and you can build it according to how many frames you want, and what sizes you choose. In our example we have placed two posters horizontal and vertical, all in 50×70 cm. The frames are back to back, so there’s art on both sides – 12 prints total! 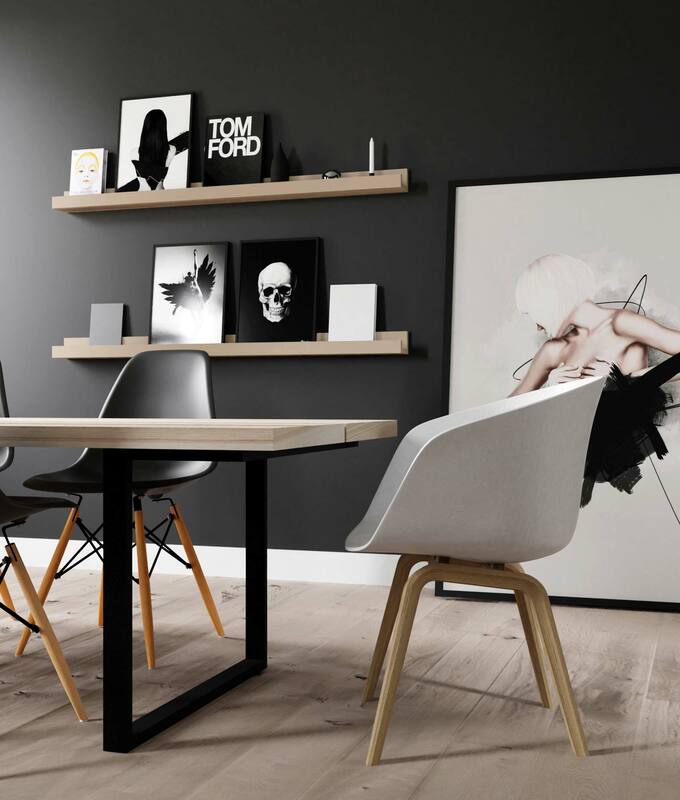 That pretty much wraps up our 10 unique gallery walls, and we hope this inspiration got you in the creative corner! We share, as mentioned, daily inspiration on Instagram and Facebook, so be sure to follow us for creative highlights. Do you know anyone who should read this blogpost? Share it on Facebook!